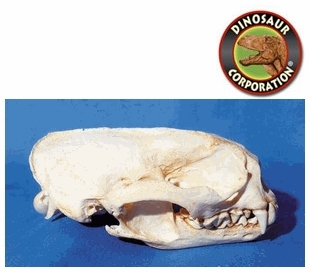 Giant South American Otter skull replica is cast from original specimen. Pteronura brasiliensis. Amazon Basin. Sluggish streams, swamps, marshes. CAS SPECIMEN. The Giant South American Otter is a South American carnivorous mammal. It is the longest member of the Mustelidae, or weasel family, a globally successful group of predators, reaching up to 1.7m (5.6 ft). Atypical of mustelids, the giant otter is a social species, with family groups typically supporting three to eight members. The groups are centered on a dominant breeding pair and are extremely cohesive and cooperative.